Karaoke is a favorite for many of those little child-like stars, including myself, whether it’s trying to get on “America’s got talent” or “X-factor” the natural rising of a star is founded on the imagination and aspiration of the child. Immersing themselves into character as each songs plays will allow them to slowly realize that yearning or maybe just have some fun with friends, either way, it’s always a great laugh and hours of joy are there to be had! Karaoke these days can be updated and modified so its age-specific, so as they age the song choice can also, which helps when the kids turn into those terrible-teenagers. This really can be a family activity and everyone can find a song they love that will bring back memories and get the whole household singing along and bonding. The actual act of singing along to music has found to be extremely beneficial for a child’s development. The emotional build-up that sometimes cannot be expressed in words can be released through singing. Another benefit can be seen in the muscle memory, which can develop through repetition and can help with later development, especially if practiced in those early years. Child Psychologist has confirmed this to be true and extensive clinical studies have been produced stating these exact findings. Furthermore, the act of reading the text and singing along is a great skill that can enhance development that might otherwise be struggling. 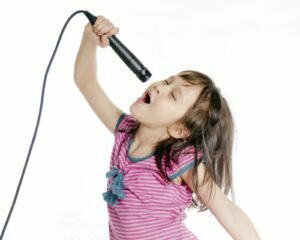 There are loads of reasons to get on the Karaoke and in my experience there is no excuse other than getting your kids enthusiastic and giving it a go yourself, so I have decided to put together a review of some of the possible thoughts, clear any misconceptions and get the kids having a good time singing along to their favorite soundtrack, maybe even yourself! 12.0.1 Portable Karaoke Machines are Ideal for Kids, Right? 12.0.4 What Types of Karaoke Microphones are Best? Below I have put together some of the better quality karaoke machines that you and the family can enjoy. There will be some differences in price and available functionality to ensure you can find the one that suits you and your families needs, but also budget. 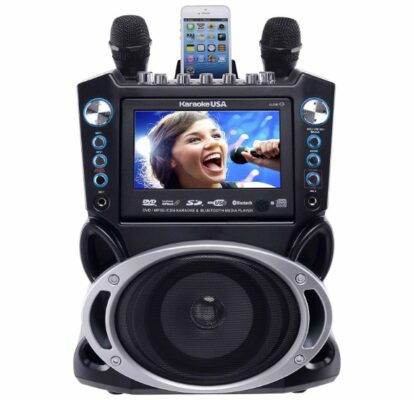 This device boasts a 7-inch color screen and comes in at the top-end for kids-karaoke, its own 35 watt digital amp it really does get you seen and heard, so if the quality of sound and real quality is what you’re looking for then giving this a mull-over would be advisable. The voice recording and music-mix is a great new feature in this review and I recommend it to those slightly older kids who are really enjoying the whole learning/singing process and have committed time and energy into making their dreams of stardom come a little closer. The remote control feature is ideal for multi-tasking and the 300 MP3-G allows the song playlist to keep updated and age appropriate. This karaoke machine is the highest in price so far in this review, but is a great system and will give countless hours of enjoyment with excellent quality of sound and functionality. The 7-inch screen unlike the previously reviewed products is a great feature and allows the all-in-one idea to be fully realized, leaving the need to be used in conjunction with other devices, in my opinion, to be lessened. This really cool LED machine brightens up most spaces and can create stars from modest beginnings. The Frozen Karaoke machine is themed and can let the imagination go wild with so much potential laying behind the device. 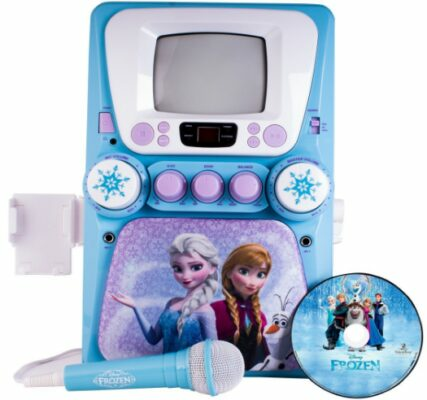 CD-G compatibility means the lyrics can be read via the television and the latest songs can be sung until their little hearts are content, whether it’s some from the movie “frozen” or something different, it’s all available with this karaoke player. The machine can be played with batteries or with electric and means this device can suit your needs and wants, which make it highly desirable and convenient. Furthermore, the built-in radio and features like digital input keep this a good contender in the karaoke machine ranks. This player is more expensive than the previous, but it does have some unique features, functions, and design which can be justified as to why it is indeed more expensive. This player has only one microphone and for some might not be ideal, but apart from that, this device is another great easy-to-use karaoke machine. I had a friend’s daughter show me this, she was so happy with it and knew all the songs, which she couldn’t help but sing out loud and I was very impressed. 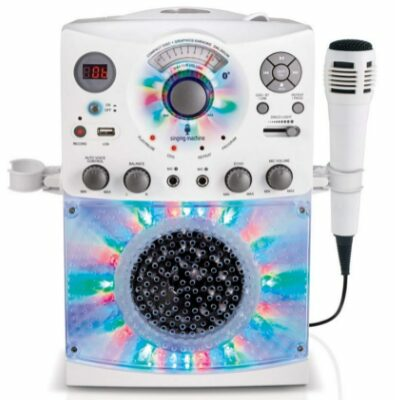 This is another great karaoke machine with adjustable height and functionality, it offers in my view a greater age range than some of the previously reviewed karaoke machines. This device can easily be set up so you can have 3-4 friends singing along at the same time. The duet is always a way of bringing friends closer and if you have ever been to a karaoke night its a lovely way to hang out and be with your friends, so for this reason i feel this specific standing system is best so far if there are going to be 2-4 wanting to sing at the same time. The guitar plug-in option means you can really start to think about the band idea options with SS3 allowing even the keyboard as well to be utilized. My Son wants to be a guitarist and if you as a parent would like your kids to be more musical than this is a great product for the kids that are getting slightly matured in their musical talents. This is a great first-time machine and will give your child/children hours of countless fun without breaking the bank balance, it comes in at the low-end of the price range and has loads of cool features, which is why i have put this in as the first contender in the review. The Microphone recording function is fun for your young child and helps them train to become aware of how their own voice sounds. This device is super-lightweight and can easily turn into a mobile device if wished, which will get them dancing and singing at the same time. The machine is easy to set up and operate, which will give the parent almost no supervision needed and let the kids take control. This device can be updated and used to connect to the latest music via streaming. The AUX cable is easy to operate and almost self-explanatory, even the On/Off couldn’t be more simple. There is a foot pedal which adds to the allure of this karaoke machine and lets the kids feel they are up on stage singing their hearts out to an applauding audience, especially because of the applauding pedal too, which activates when pressed. The batteries are included here and ready to use, which is great comparing to most other products, which don’t have as standard. This karaoke machine is a great first-time buy and will keep your little ones entertained for hours while you get to see your gem turn into a diamond. Its time to give the rock and pop stars of the future a little kick start to their careers with this amazing kids karaoke machine. This Machine is styled after the minions from the Despicable Me franchise, so this will make a brilliant gift for fans of the movies. It has simple controls for volume, echo, and balance, making it very intuitive for children to use, and it has auto voice control buttons to make adjustments for shy singers. Although this machine doesn’t have its own screen, it has a video jack which will easily connect to your TV for the lyrics scroll. It has built in speakers, but can also be connected to wired audio devices too. It also has a second microphone jack for singing duets, but only one microphone is included. Overall, we like this because it is cute, easy to use and very portable. 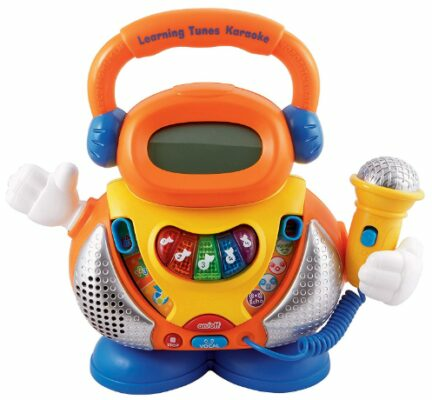 This great toddler Karaoke machine is perfect for little ones who love to belt out their favorite songs. 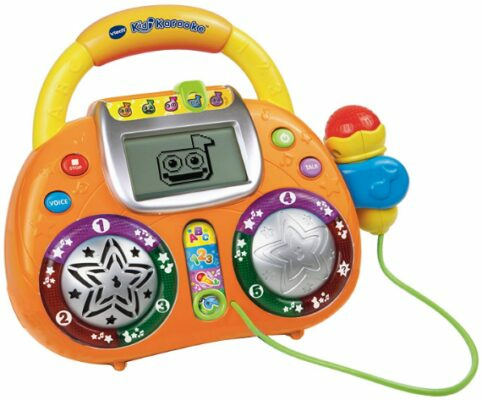 We love just how portable this is, with its easy to hold the handle, and all the control buttons are big and clearly marked, making this a great electronic toy that toddlers can use. It also comes with 2 microphones included, making it a great choice for siblings. Despite how simple it looks, this machine has lots of options on how you can use it. Your kids can sing into the 2 mics on their own, or play music play via Bluetooth, usb connection, micro SDs and more. 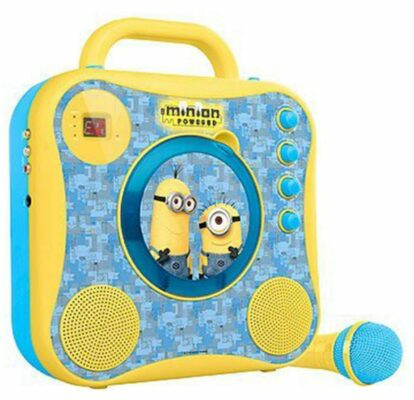 No matter what format their favorite song is, they can play it through this toddler karaoke set no problem. We also really love the fact that this karaoke toy is dual power sourced, meaning that you can plug it in with a USB cable or use batteries, meaning that your kids can use it plugged in at home or take it to other places with the batteries. Overall, this is a great, simple and durable karaoke toy that toddlers and younger kids will love. Does your toddler love to sing and dance? If so, we might have the best gift for them here with this cool Vtech Kids Karaoke machine. This toy has been specially designed to help in your child development by introducing them to letters and numbers, so this is a nice educational toy as well as a singing machine. This comes with 15 songs included, which encourage your child to groove along as they learn about letters and numbers, and the LED screen will entertain them with animations as they sing. The microphone also has some really cool effects, such as pitch changing and robot voice, which your toddlers will have a real blast playing with. Parents can also rest easy knowing that this has parent controls built in, including volume control and automatic shut off so the batteries don’t get wasted. This is a great little machine that toddlers will love playing with. The only real downside is that, although you can use the mic without the music, there’s no way to play mp3s or other music through the player. This cute little robot shaped machine is perfect for bringing the world of music to your child!using the attached microphone, your child can rock and jam along to its 15 cool tracks and really sing their heart out. As they do, the LCD screen will display the robots face, showing all kinds of fun expressions and animations as they sing. The machine also has three different modes; numbers, letters and fun songs, which your child can switch between depending on how their feeling. so this can be a cool development toy as well as a kids karaoke machine. Your children will also amuse themselves for hours using the 4 different voice effects, and they can use the mic without playing the songs too if they want. Overall, this is a very cool and very cute little karaoke for kids machine, and as its so small it won’t take up much storage space. Coming in both white and black colors, this awesome Karaoke for kids machine will bring hours of joy and musically fun for your children. This has CD and CDG players, so all of your children favorite tunes can easily find their way onto this cool machine and they can sing their hearts out. This set has everything you’ll need to get your kids singing, including build-in speakers, a microphone, and awesome LED light displays, so all you need to do is plug it in and pop in a CD. You can easily connect to other devices through Bluetooth or auxiliary input if the built-in speakers aren’t loud enough, and an RCA output jacks connect to your TV to scroll the lyrics. This cool package includes the machine itself, Ac adapter, one microphone, a demo disk and 5 bonus songs for download. This is one of the best karaoke sets for kids we’ve seen and will be good for older children who want something a bit more grown up. The “Kids Portable Karaoke System – USA” is a great overall product and although the difference is only slightly in my opinion, there is, however, a slight difference. The 7-inch screen is a lovely touch and is nice and easy to use, which is great for just enjoying without having to get other systems integrated in order for a higher quality of sound or lyric visibility. The speakers are loud enough where the singing, if out of tune, can be slightly drowned out and help with getting into the overall enjoyment and not putting your fingers in your eyes when tone-deaf dad is doing Micheal Jackson impersonations. The “Kids Karaoke Machine” is a low-budget please and does most of what is needed for the kids to just getting started singing and having a good time. The adjustable and portable features allow for all the kids to have a go and sing along until they are feeling satisfied that they are the next “Madonna”. This is really easy to use karaoke machine and if you as a parent are wanting them to enjoy without needing any assistance then this is the one for you! Portable Karaoke Machines are Ideal for Kids, Right? Size does matter in the karaoke world and portability is important in the modern times we find ourselves in, so make sure in my review section you see which will suit your own personal circumstances and have no regrets, that wouldn’t be nice! The average child wants to move the karaoke machine into various rooms depending on the time of day, friends being over or maybe when dad the “Freddie Mercury” star gets home from work, so simply remember to consider the size before purchasing. For example, if the child is really young (4 to 6) then maybe getting a really super lightweight beginners karaoke machine will be best, simply because they are always moving around, trying to impress and also get the attention from older figures around the house. Kids have a tendency to get a little clumsy and forgetful, just being careless really, and so sometimes they might drop the microphone or get a little carried away with the duo, so a quality machine build is important. There are different quality built machines and some are more specifically designed for kids, which can withstand the onslaught of the kids’ parties or sleepovers. The market has various standards and most reflect in price, but as a general rule, the price increase reflects quality. However, if your child is young and just looking for some fun then maybe the more expensive karaoke machines are less important than the child that aspires to be the next Rhianna. Balance is important and my advice is to just think about how your child will use the machine and then buy appropriately based on those factors. One of my boys loves to Karaoke and with that, he brings it out at every possible occasion and therefore we decided to get him a quality karaoke machine which can be noticed when comparing to the one first bought. There are different types of karaoke machines from software-based machines to standing units and even the component-based system, which means there is a karaoke experience for you and little ones no matter the situation. The stand-alone machines are usually all-in-one and can be easily transported and used on the move, which suits those younger, more mobile singers. Software-based machines need a computer or iPad to operate and can be fun to use in a car or other times that naturally brings everyone together. Machines that are component based are usually integrated into the home system and fit into those homes that have a good setup already. With these 3 main configurations, you can find the basic setup that will suit your karaoke needs and get the fun beginning and all to start singing. What Types of Karaoke Microphones are Best? Microphones come in various shapes and sizes, with unique functions and sound quality. There are a few type of microphones to consider when making a choice, whether its wireless or cable-connected for example and by having an idea of this before choosing will narrow the multitude of choice and get you on your way to karaoke-stardom. 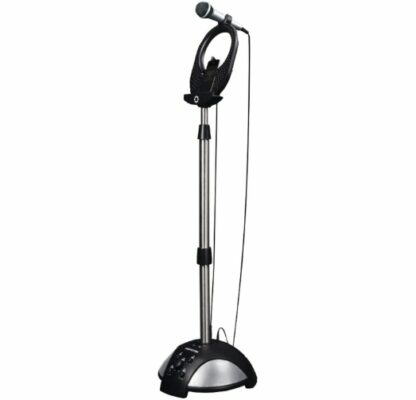 A lot of standalone karaoke machines have a microphone built-in-wire and an option to use another mic jack so the duo-function can be used. In my experience, the karaoke machines with duo-function capacity is preferable simply for the reason that singing side-by-side is great fun and enhances sibling bonding. The quality of microphone has recently changed and there is more overall quality to be enjoyed. Some microphones can produce better quality of sound and if your child is spending loads of time practicing and wants to be a star on “Pop idol” then make sure you factor this in, because a kid that doesn’t hear the real quality of their own voice/tone can not vastly improve in certain performance. Sometimes the shopper in their eagerness to buy can forget some factors like; is there a voice recorder or can the playlist be updated. These kinda questioned should be ironed-out to make sure there is no unwanted returns. Do you want to plug-in other musical instruments? Girl or boy karaoke machine? Last is not always least important and this final point is crucial for the child’s entertainment experience, because if they think that they are able to use their iPad gadgets or iTunes with MP3 they are mistaken, however they can with the latest MP3+G which enables song/rhythm in the files. This is the most important factor I consider when thinking about music and what format is appropriate, otherwise it is pretty straight forward. A lot of the karaoke machines come with built-in-speakers and can have auto voice control, so make sure you decide if you want to have quality sound or not, because if your like my partner and is OCD about sound quality then its worth a little extra thought and time.